At the Grossman Imaging Center, you'll have access to the largest group of subspecialized, fellowship-trained radiologists on Long Island. Because where you go for imaging matters—and you shouldn't have to travel far to get there. At the Grossman Imaging Center, we’re focused on the full picture of your health. We offer a full range of diagnostic and breast imaging services in a comfortable, spa-like setting. Our extensive imaging capabilities support a wide range of diagnostic goals, including primary diagnosis, the tracking of treatment progress, presurgical testing and postoperative analysis. Grossman Imaging Center is part of Northwell Health Imaging—a network of ambulatory imaging centers spanning Long Island, New York City and Westchester. Northwell Imaging is the first radiology practice in New York state designated by the American College of Radiology as a Diagnostic Center of Excellence based upon our efficient, safe, high quality care. We use state-of-the-art equipment and the very latest advances in imaging techniques to ensure consistent, high quality images and uncompromised accuracy. Our facility is located behind the Gertrude and Louis Feil Campus for Ambulatory Care building in Manorville, just off the Long Island Expressway (LIE) at exit 70. Grossman Imaging Center and Northwell Health Imaging at North Fork in Riverhead are here to support the screening and diagnostic imaging needs of residents of the east end of Long Island. MRI scan – Magnetic resonance imaging (MRI) is a diagnostic imaging procedure that uses a combination of a large magnet, radiofrequencies and a computer to produce detailed images of organs and structures within the body. 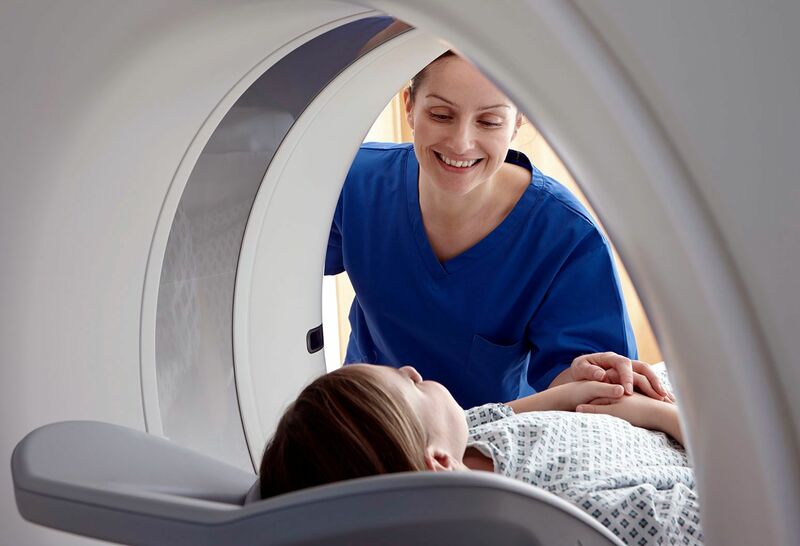 CT scan – Also known as a CAT scan, this diagnostic imaging procedure uses a combination of X-rays and computer technology to produce images of the body. Lung cancer screening – Lung cancer screening is a regular preventive health check, much like a mammogram or colonoscopy. It is used to test for lung cancer before you have symptoms. Our screening experts are trained in detecting lung cancer in its earliest and most treatable stages—so that they can act before the disease has a chance to spread. Ultrasound (sonogram) – An ultrasound is a noninvasive diagnostic procedure used to assess soft tissue structures such as muscles, blood vessels and organs. It uses sound waves that bounce off the organs like an echo and are converted by a computer into an electronic picture of the organs or tissues under study. Digital X-ray – X-rays use electromagnetic energy beams to produce images of internal tissues, bones and organs. DEXA scan (bone density test) – A bone densitometry test is used to diagnose osteoporosis, a condition in which bones become fragile and brittle. 3D mammogram – Also known as a digital mammogram or digital breast tomosynthesis, 3D mammography allows the radiologist to examine breast tissue one layer at a time. This improves the ability to detect abnormalities while reducing false alarms due to overlapping tissue. Breast ultrasound – An ultrasound, also commonly referred to as a sonogram, is a diagnostic imaging procedure used to view internal organs as they function and to assess blood flow through vessels. At Grossman Imaging Center, you’ll find trained radiology technologists ready to help you with the imaging you need. Watch our video to learn more about our full range of services, modern imaging equipment and more. We accept most medical plans, including Medicare and Medicaid. Please check with our front desk to determine if our radiologists participate with your insurance plan. As part of our transition to Northwell Health, you may see some billing changes. For example, you may receive insurance statements indicating that our radiologists do not participate with your insurance plan. This is a temporary situation during the transition. If you receive such correspondence from your insurance company, please call (855) 571-5843. We're happy to work with you to resolve any issues with your insurance company.